Welterweight World Champion Keith Thurman sat down for an exclusive video interview with Brendan Schaub for the SHOWTIME Sports digital talk show BELOW THE BELT, sharing his thoughts on tonight’s bout between Danny Garcia and Shawn Porter for the WBC welterweight belt that he was forced to vacate. “One Time”, who has previously defeated both of tonight’s headliners, sees the fight as a 50-50 matchup but ultimately believes Porter will prevail via decision. When Schaub presses for a final prediction, Thurman does not hesitate, saying he sees it as a 12-round decision for Shawn “Showtime” Porter. Welterweight World Champion Keith Thurman will serve as a guest analyst this Saturday on SHOWTIME CHAMPIONSHIP BOXING COUNTDOWN, providing insight and analysis during undercard streaming fights in advance of this Saturday’s Danny Garcia vs. Shawn Porter WBC Welterweight World Championship. Live streaming coverage from Barclays Center begins at 7 p.m. ET/4 p.m. PT on the SHOWTIME Sports YouTube channel and SHOWTIME Boxing Facebook page and features multiple live fights and analysis preceding the evening’s three-fight SHOWTIME CHAMPIONSHIP BOXING® telecast (9 p.m. ET/6 p.m. PT). In the featured bout of SHOWTIME CHAMPIONSHIP BOXING COUNTDOWN, Amanda Serrano (34-1-1, 26 KOs) will attempt to make women’s boxing history as the five-division world champion faces Yamila Esther Reynoso (11-4-3, 8 KOs) the vacant WBO Junior Welterweight World Title. A win will place Serrano in elite company alongside Manny Pacquiao and Oscar De La Hoya as boxing’s only six-division world champions. Thurman will join host Ray Flores and analyst Chris Mannix to call the streaming action Saturday from Brooklyn. The reigning WBA Welterweight Champion, Thurman has previously defeated both of Saturday’s headliners. “One Time” edged Porter in a 2016 Fight of The Year Candidate, and narrowly defeated Garcia in a split-decision win to unify the division in 2017. Saturday’s SHOWTIME CHAMPIONSHIP BOXING COUNTDOWN will feature multiple bouts in what will be the seventh digital presentation of live fights from SHOWTIME Sports in 2018. For the third straight year, the network continues to deliver industry-leading livestream coverage of boxing free to all U.S. consumers with internet access. Polish slugger Adam Kownacki and former heavyweight champion Charles Martin will open up Saturday’s SHOWTIME CHAMPIONSHIP BOXING telecast with a 10-round heavyweight attraction. In the co-feature, 147-pound contender Yordenis Ugas will battle against Argentinian favorite Cesar Barrionuevo in a welterweight world-title eliminator showdown. 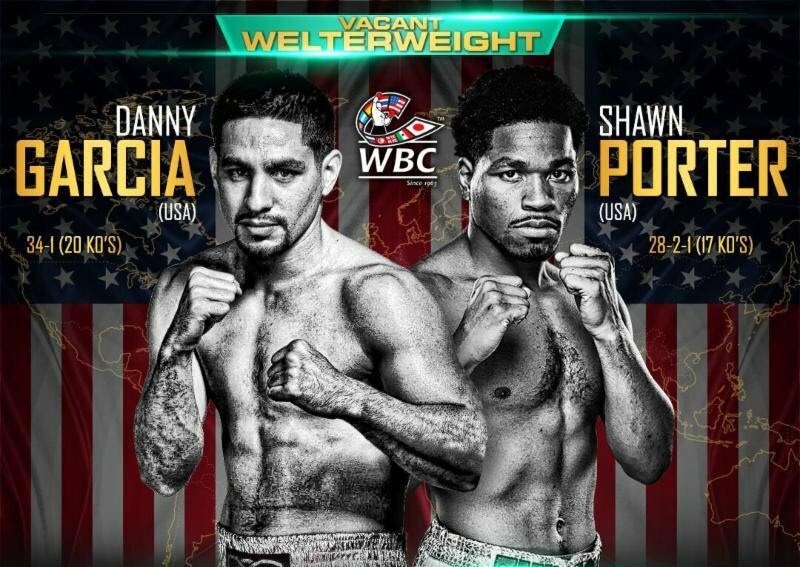 Coming on the heels of Premier Boxing Champions’ (PBC) groundbreaking deals with both FOX Sports and SHOWTIME Sports, many of the brightest stars in the PBC galaxy will be ringside Saturday night to see one of the biggest fights of the year live and in person as Danny Garcia takes on Shawn Porter in a welterweight world title fight. Expected to be seated ringside at Barclays Center will be several current or former world champions in a variety of weight classes. 33 world champions have been recognized by the WBC, of whom only six have regained the title: Jose Napoles (Cuba-Mex), Ray Leonard (US), Lloyd Honeyghan (Jamaica-GB), Oscar de la Hoya (US-Mex), Shane Mosley (US), Floyd Mayweather Jr. (US). 131 WBC welterweight world title bouts have been held in the history of the WBC. 101 WBC welterweight world title bouts have taken place in the United States. Previous boxing news: Oleksandr Usyk & Jono Carroll Sign With Matchroom Boxing!